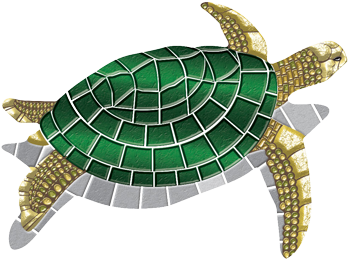 Silhouetted Poolsaic™ cutouts haveno background or border so they look like real inlaid mosaic tile on your pool floor. Poolsaic™ drop-ins are removeable and require no adhesive or installation. Simply drop the pool art into your pool and let it sink to the bottom. Large pool graphics provide hours of beautiful imagery all season. Made of 1/8" thick vinyl (the same material used in vinyl pool liners) and held in place by the weight of the material and gravity of the water. Affordable accessory for all types of pools including concrete pools, vinyl pools, above ground pools, inground pools, gunite and fiberglass pools. Won't interfere with automatic pool cleaners and resists pool chemicals and UV rays. Do not place pool mosaics on an incline or rough surface as air bubbles underneath the material will cause pool art to shift. Not recommended for use with bubble jet cleaning systems. 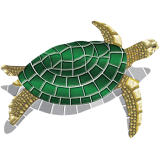 Turtle Mosaic - LG 60" x 80"
Turtle Mosaic - SM 30" x 40"